This page is for the original release. 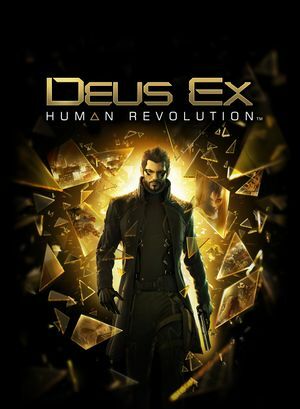 For the Director's Cut, see Deus Ex: Human Revolution - Director's Cut. The Augmented Edition includes an art book and other non-game extras (install under Tools in the Steam client). The Ultimate Edition includes this content. The Ultimate Edition is a complete edition with all DLC and the Augmented Edition extras. It is only available for OS X. The Director's Cut has various changes and additional content; refer to its page for details. DLC is no longer sold on Steam but can still be purchased from other stores like amazon.com. Sold separately for Windows; included with the OS X version. Make a backup of patch0.000. Download the No Intro Fix. Move this new patch0.000 to the installation folder. FOV is locked at 75° in fullscreen (use borderless fullscreen to unlock FOV). Some text elements do not scale well, such as subtitles or PDAs. 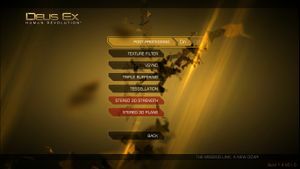 75-100° horizontal; for multi-monitor use borderless fullscreen to allow changing FOV. Toggle with Alt+↵ Enter. If the taskbar is visible use Borderless Gaming instead. Although mouse acceleration is disabled, players could still experience some weird behaviors. See mouse "acceleration". Native support; see the WSGF entry for an alternate method. 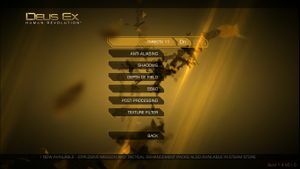 Some users have reported a drop in fps that continues until the game is closed. Locate "AllowJobStealing" and change the value to "0". For Nvidia owners: Also change "AtiForceFetch4" and set it to "0". If your game crashes when a tutorial pops up and only shows black, go into the game options and disable tutorials. You are more than likely experiencing microstutter. To fix this, disable your 2nd/3rd monitors in windows. So that you only are running one monitor. If you own an AMD Bulldozer CPU and the game is laggy (or the audio is stuttering), you can download and run a program called Orochi-Ceg that may fix the issue. It should be noted that this solution is temporary and that it may have already been fixed by your motherboard manufacturer. You are recommended to search for a BIOS update on their website for a permanent fix. You should not, in any case, run this program if you have an Intel processor. There are modified unofficial BIOSes that you can run that may also fix the issues. Use of these BIOSes are at your own discretion. 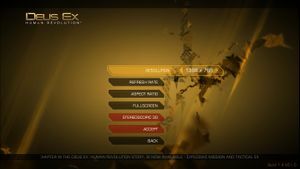 Some users have discovered an issue where the HUD moves itself to the left-middle of the screen, as though it were placed for a different resolution. Although a restart of the game usually fixes it, this may not be the case for everyone. This thread, on Eidos' forums, details a number of other fixes users have tried, successfully, to remedy the fix. The following graphics cards are not supported on OS X: ATI Radeon X1xxx series, ATI Radeon HD2xxx series, Nvidia GeForce 9400, Nvidia 7xxx series, Nvidia GeForce 320M, Intel HD3000 and Intel GMA series. ↑ 1.0 1.1 File/folder structure within this directory reflects the path(s) listed for Windows and/or Steam game data (use Wine regedit to access Windows registry paths). Games with Steam Cloud support may store data in ~/.steam/steam/userdata/<user-id>/28050/ in addition to or instead of this directory. The app ID (28050) may differ in some cases. Treat backslashes as forward slashes. See the glossary page for details.